It’s official, JAM Hair is Croydon’s go-to salon for tip-top customer care! And it’s not just our clients that say so…. 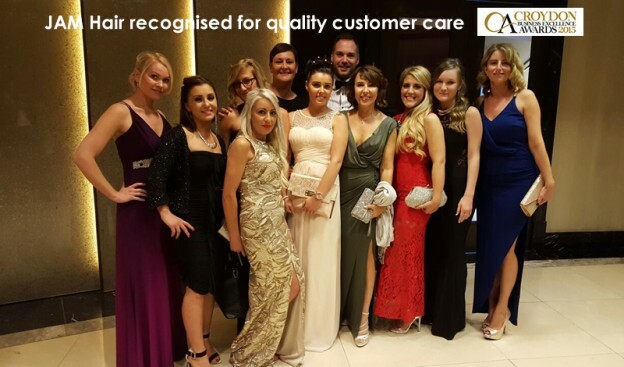 The judges from the [Croydon Business Excellence Awards] were blown away by our customer-first philosophy and awarded the salon Highly Commended in the Best Business For Customer Service. The glitzy Awards Ceremony at the Fairfield Halls was hosted by TV presenter James Whale and also saw JAM Highly Commended in the Independent Retailer of the Year, and Commended in the Best Business for Marketing and Social Media category. Salon owner Jacqui says: “We strive to not only give our clients quality hairdressing services, but also to deliver fantastic customer service on each and every visit to the salon. “So we’re thrilled to have been recognised by the Croydon Business Excellence Awards for the high standards we consistently deliver. 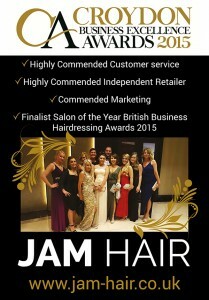 To find out why the judges were so impressed by our marketing and social media follow @JamHairCroydon or like www.facebook.com/jamhair for hair care tips and advice and exclusive offers. This entry was posted in blog, Salon News, Uncategorized on October 15, 2015 by admin.